Being-in-the-Gallery brings together a number of facets of my practice: my love of the figure, my interest in perception and my fascination with our understanding of ourselves. 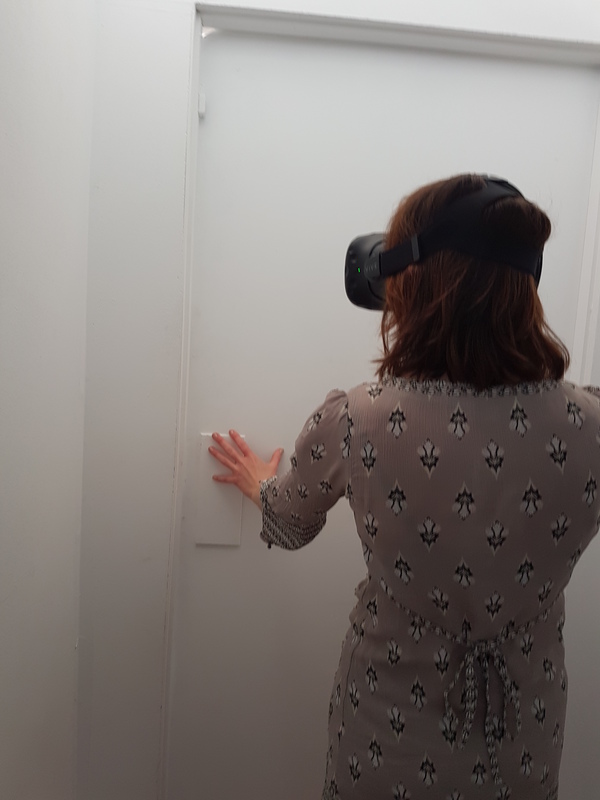 The viewer/participant enters an immersive environment by donning a HTC Vive headset and walking into the gallery through a doorway, both physical and digital. Virtual Reality is culturally associated with the idea of being somewhere else, of escaping to some other world. It serves to fuel the extropian dream that we can someday leave our physical bodies behind. Using cutting-edge VR technology – the HTC Vive – I have built a work which I hope will serve to remind those who encounter it of our essential embodiment or, to adapt a phrase from Phenomenology, of our Being-in-the-World. By combining a physical and a digital object I have created a mixed reality in which questions of being and experiencing may be explored. The statue could be considered an art-work in its own right; it would not look out of place in a physical gallery. But what happens when we present two versions of the same object – one physically and one digitally – transposed upon each other? It opens up the opportunity to revisit and explore questions of aesthetics. Is the aura of the work lost? Is its uniqueness diminished with presentation of an immediate reproduction of itself? How do we experience the disconnect between what we can see and what we can touch?